This is an ancient Scottish name, the patronymic (meaning "son of") form of Hendry, a mainly Scottish variant of the personal name "Henry". Some bearers of the name Henderson are descended from Henrysons, the "d" being a common intrusive element in many languages between "n" and "r". Henry is from a Germanic personal name composed of the elements "haim" or "heim", home, and "ric", power. It was introduced into England by the Normans after the Conquest of 1066 as "Henri". In Scotland the Hendersons of Fordell in Fifeshire are the chief Lowland family of the name, and are believed to be descended from an old Dumfriesshire family of Henrysons. 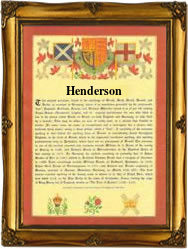 A branch of the Clan Gunn bears the name Henderson, and there is another Clan Henderson of Glencoe. An interesting namebearer, recorded in the "Dictionary of National Biography", was John Henderson (1747 - 1785), who was a notable actor of his day, considered second only to David Garrick. The first recorded spelling of the family name is shown to be that of William Henrisone, which was dated 1374, in Scottish Papers, in the Public Records Office, during the reign of King Robert 11 of Scotland, 1371 - 1390. Surnames became necessary when governments introduced personal taxation. In England this was known as Poll Tax. Throughout the centuries, surnames in every country have continued to "develop" often leading to astonishing variants of the original spelling.